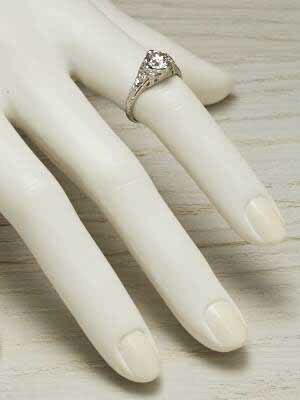 Diamond bowties wrap this Edwardian antique engagement ring's diamond into an unforgettable gift. 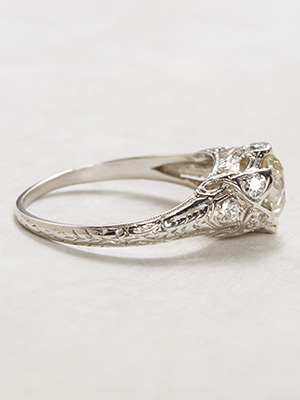 Diamonds and ribbons and bows give this antique engagement ring festive appeal. Every time she looks at it will be cause for celebration. Bead set at the top, bottom and sides of the diamond is a collection of accenting diamonds. The graduated band is etched down the shoulders with chevrons. 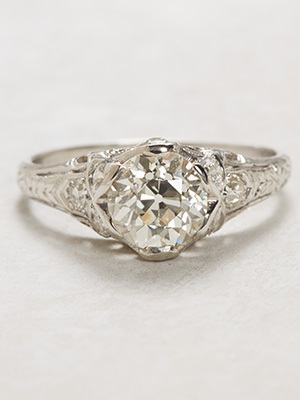 The center diamond is EGL certified. Details: Antique. Edwardian. Circa 1920. Platinum. 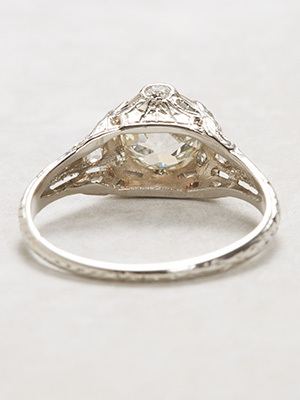 Old European cut diamonds; 1.47 carats. 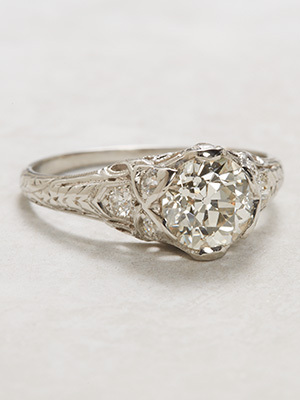 Special characteristics This late Edwardian engagement ring features a classic pierced filigree mounting, circa 1920. The EGL certified 1.17 carat old European cut diamond is 6 prong set in an integrated center head. Eight (8) smaller old European cut diamonds are bead set on the sides.